People selling items over the internet have been warned by the Metropolitan Police about a fraudulent payment scam. Fraudsters posing as a buyer will send a cheque of far greater value than the price of the item up for sale. They will then arrange with the seller to be reimbursed the extra money by electronic money transfer. However, the cheque they sent is stolen and it can take several weeks for this to be discovered and by then they have collected the seller's refund. Detective Chief Inspector Stuart Dark of the Metropolitan Police's Economic and Specialist Crime Unit urged people selling items online or through newspaper adverts to be on their guard. "The advice to anyone who is selling something is do not accept a cheque or banker's draft for any amount over your asking price." "You should also be suspicious if the buyer appears reluctant to meet up to view an item for sale where this would normally be the usual procedure." The fraud works by exploiting a quirk in the UK payments system. Victims receive a cheque, bank it and are reassured to see the money pass into their account. It can take weeks for the banked cheque to be identified as stolen, by then the victim has reimbursed the fraudster for the phoney overpayment. 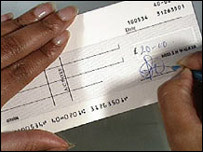 The victim loses out because once the cheque is identified as stolen, the bank will automatically take back the money. As a result, it is the victim and not the bank that is liable for the loss.